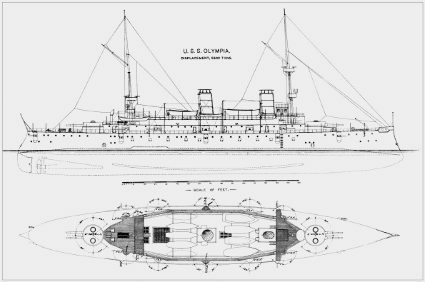 USS Olympia Plans of the US Navy Protected Cruiser from the Spanish-American War. Model boat builders, Historians and Educators: Download it here in either 1/96 or 1/144 scale. A contemporary plan of the USS Olympia showing "General Arrangements". The Scanned General Arrangement Plan is from 1893, so predates the ship's first commission. It has been re-sized to the correct scale and digitally enhanced. As a result, the plan sheet is remarkably clear and detailed. 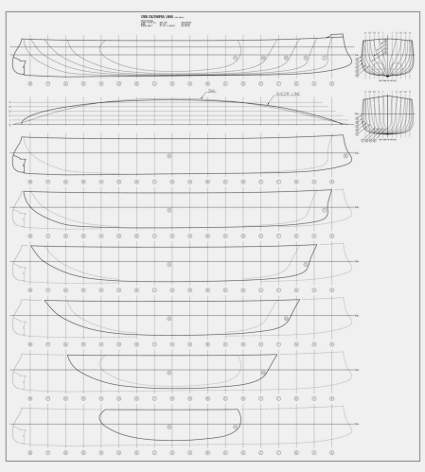 CAD generated hull lines and buttocks templates for Bread-and-Butter construction. 3/8" thick hobby lumber or "thin wood"
CAD generated section templates - ideal for plank-on-bulkhead construction. Each section has been laid out in a separate pdf document on regular "letter" (8 1/2 X 11 inch) paper. For those outside the US, the template can be printed (and still fit) onto A4 size paper. Just make sure you select "scaling" = "None" when printing. Each template has a horizontal line going through it representing the Design Water Line (DWL) and a vertical center line. Both are there with the intent to aid the process of referencing bulkheads to keelson. 1:96 scale in a single zip file. 1:144 scale in a single zip file. If you have any questions or comments about these plans, please use the form on the Contact Page. 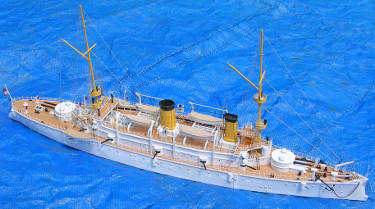 Read about Roger Kreiter's model of the USS Olympia built from these plans.